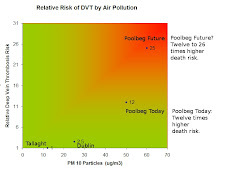 The Galway Tent Blog: Incinerators Nanoparticles are safe. Trust Us. 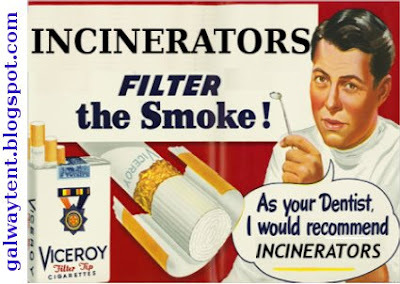 Incinerators Nanoparticles are safe. Trust Us. 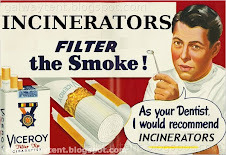 Tiny particles from incinerators will reduce your life by up to two years. Nobody understands the science. That's why we have Fianna Fail. You can trust your clever politicians to protect you by directing their political appointees, dressed up as scientists, at EPA, Bord Pleanala, and elsewhere. TOXICOLOGICAL EFFECTS of nano-particles such as those produced from an incinerator stack can be responsible for exacerbating human health problems including asthma, bronchitis and heart disease, according to a scientific expert who gave evidence on behalf of objectors at a public hearing yesterday. Prof C Vyvyan Howard described Indaver Ireland’s risk assessment of possible health problems associated with a proposed toxic waste incinerator at Ringaskiddy in Cork as “simplistic” and “fundamentally flawed”. His claims were disputed by Indaver Ireland. Prof Howard, who is in charge of of bioimaging at the University of Ulster, has written and spoken in a variety of forums to draw attention to the threat posed by pollutants to developing foetuses and infants. Prof Howard said while effects of individual toxins were known, the effects of multiple toxins in the air was unknown, and research into such effects was difficult. Indaver Ireland’s risk assessment is based on the effects of individual toxins as per Environmental Protection Agency air quality standards. “This approach is fundamentally flawed for those emissions like particles, for which no safe level can be demonstrated,” Prof Howard said. Air pollution levels well within legal limits were killing people, he claimed, “especially older people and those with chronic heart and lung ailments”. Children and foetuses were particularly at risk from airborne pollutant particles, as their immune system and lungs were not fully developed, he said. “There can be no doubt that children and even the foetus are particularly vulnerable to particle air pollutants, while this has been largely overlooked in setting current standards and controls,” he said. He cited a review by scientists Joachim Heinrich and Remy Slama showing fine particle pollutants had been associated with infant mortality, impaired lung function and, less consistently, with sudden infant death syndrome. In his report, Prof Howard claimed Indaver had “completely omitted any consideration of secondary particles and their impacts from their assessments”, which he said can account for a major fraction of the particles emitted by incinerators, despite filtration. It was claimed that a high proportion of ultra-fine particles emitted through the incineration process evaded filtration systems. “The subsequent direct uptake of these respirable particles and the ready transfer from the lungs into the bloodstream may be part of the reason that traditional toxicology is at a loss to explain the level of impacts for such apparently low exposures,” he said. An Indaver Ireland spokesman said Prof Howard’s opinion was “at odds” with views of the World Health Organisation, EU and EPA. “Dioxins are all around us every day. Traffic, home heating and agriculture are among the main dioxin contributors. WHO and EU set safe level limits for dioxin emissions, and expert analysis has shown that the proposed development will have a minuscule effect,” the spokesman said. The hearing is expected to continue until the end of next week. Nano technology concentrates on advanced techniques to facilitate effective release of vaccine, medicine to precise marked cells which are maligned or diseased. It is helpful to cure psychiatric turmoil, cancer, gene therapy. To some extent it also helps to cure hard-healing wounds in diabetics, tumors, defective-degenerative valve or muscle, arrhythmic heart etc.